The World Cup season has finally ended with Germany being the winner of the FIFA World Cup 2014. Unfortunate enough for Argentina to lose during the extra time but I would respect them for defending so well throughout the 90minutes mark. On top of all that, I was lucky enough to be invited to join Domino's Malaysia for the Exclusing Viewing party! The party was held in Tropicana Golf & Country Resort Clubhouse. I've passed by a number of ridiculously and amazingly huge houses along the way. Upon arrival, there was ample parking everywhere. Simply parked at one and ran up to register myself. Look at the amount of beanbags available for us! Hell it was comfortable to obtain 3 beanbags and stack them up like a bed (which was what I did during the game). I would really like to thank them for putting so much effort into preparing the location of viewing. Initially, I thought it was gonna be at the golfing area where its gonna be hot and sticky, but to my surprised, it was indoors with aircon (and it was really cold, should've brought a jacket or something). Besides the viewing area, there are also several games and activities to participate before the viewing at 3am. One of which is the human foosball. Strap yourself in with your team and play! Shared between the few of us, really enjoyed the chicken wings and pizzas! Football balancing while eating pizzas! The person with the highest score won Domino Vouchers! One of the biggest event besides the world cup was the winner of the Instagram iPad contest. The one with the most likes wins an iPad Mini WiFi, on the spot. And unfortunately it wasn't me. Before the starting of the match. 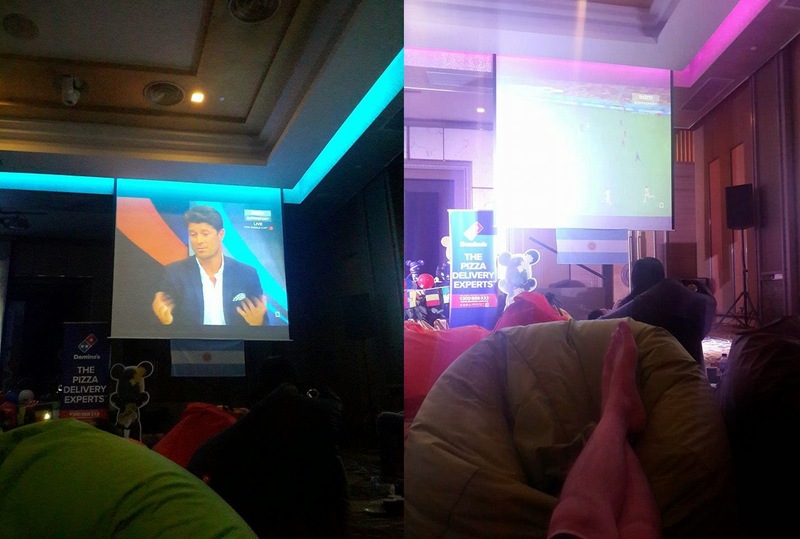 In conclusion, I would say that I really am glad to be able to spend my time watching the world cup here at Tropicana Golf & Country Resort with everyone. There were plentiful of food and drinks available, comfortable bean bags, a crowd that cheers for Germany, fun MCs and of course, friends and bloggers who were with me. It is also thanks to them that I do not have to overnight at a mamak! It has been the best World Cup Experience for me and I really am grateful for that!